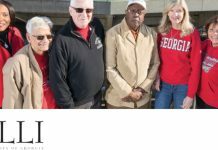 Outgoing president Brenda Hayes recently gave a year end report on the State of Olli@UGA at the State Botanical Garden. 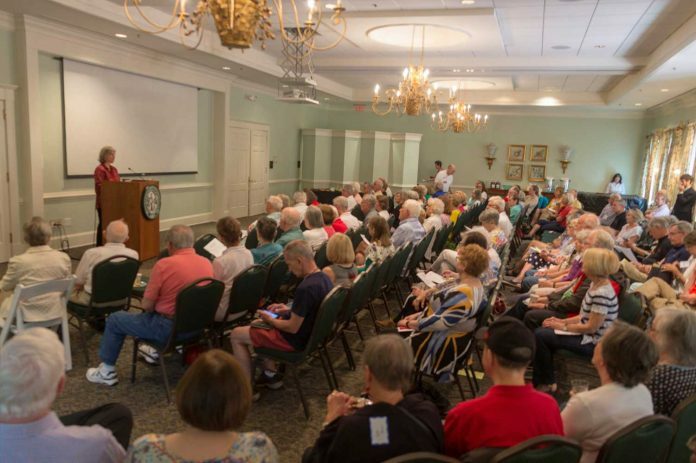 When the Executive Director, Tim Meehan, asked if anyone had moved to the Athens area because there was an OLLI, a half dozen people raised their hands at the recent annual meeting. He also reported that a record number of classes were held over the past two semesters, both of which were attended by over 800 members. A new year gets started on July 1 with renewals and new memberships being processed from June 1. New catalogs of classes, shared interest groups, and travel plans will be in the mail in early July. Class registration for members opens July 25. To register online, go to www.olli.uga.edu. 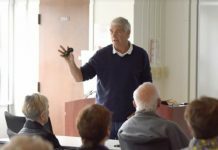 One new group that’s getting started is the “SilverDawgs” who are training to become UGA’s first “cordiality corps.” Inspired by the warm welcome from the Fighting Irish Usher Corps at Notre Dame last year, local members want to replicate the concept beginning this Fall.